Happy Thursday! It's finally our first Fall-like day since Fall arrived. The temperature is dropping 20 degrees today from the sweltering 90 degree heat wave! The leaves are falling, the sun is shining and I won't pass out on my run this morning. 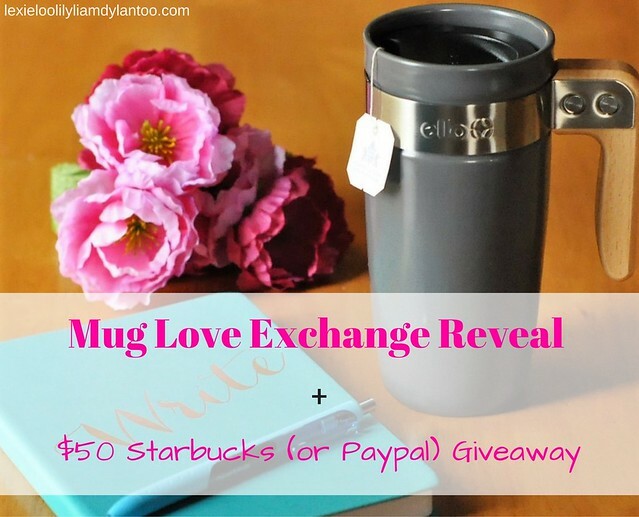 It's a perfect day for the Mug Love Exchange reveal and $50 Starbucks (or PayPal) Giveaway! 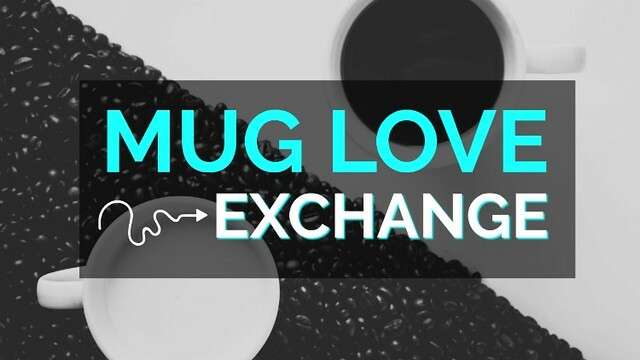 The Mug Love Exchange is one of my new favorite traditions! This is my second year participating and my first year co-hosting. 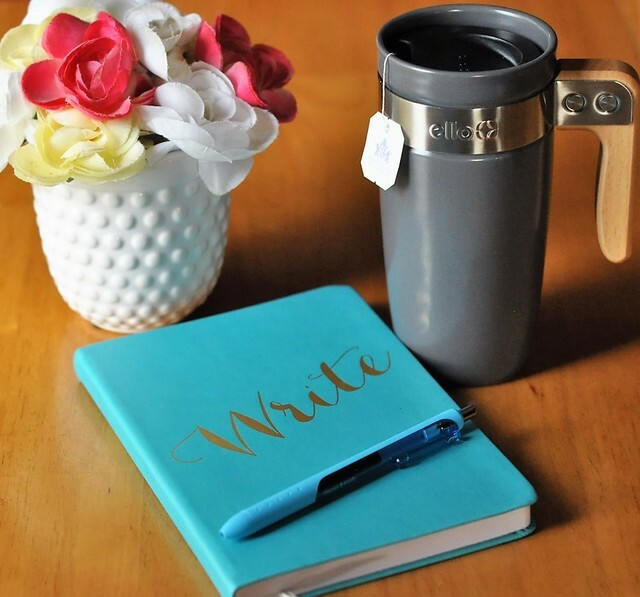 I love picking out mugs for my collection, but it's MORE fun to see what a blogging friend chooses for you! This year, I was paired with Heather Bixler. I didn't know her prior to the mug love exchange, but she sure is sweet! Through our emails, I could easily tell she was a loving person with a big heart! The package she sent was so thoughtful! 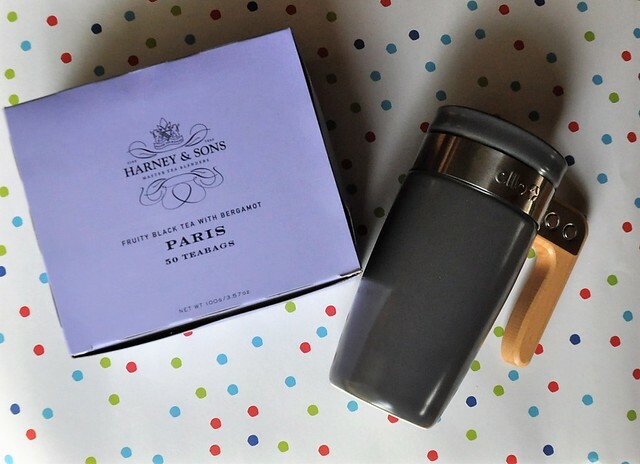 It included a sturdy ceramic travel mug with a pretty wood handle. 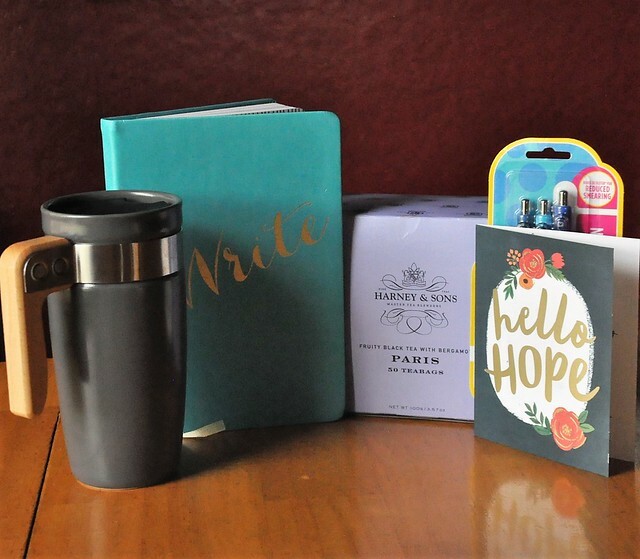 There was also a box of tea, a journal for jotting down blog ideas, and some new pens. It was perfect! I'm always running out the door to drive one of my four kids somewhere, so the travel mug was a great idea! It fits perfectly in my cup holder, and the handle makes it easy to hold while I'm driving. It's functional, but classy, and I've been using it for the past few days at home, too. My hot drink of choice is tea. I've never tried the brand of tea that Heather sent, but it's good! Black tea is my favorite, and this one has a hint of a fruity flavor. It's a nice alternative to my usual Tazo Awake tea! The box of 50 tea bags should last me, oh, 5 days. I'm kidding, of course. I do drink it all day long, but if I drank that much, I would never sleep! My life is fueled by caffeine, but I have to cut it off by dinner time, or I can't fall asleep. The journal and pens were a great addition to my gift! I'm always jotting down ideas and things that my kids say that I want to remember on post its. I have notebooks, but I'm not good about using them. I've been keeping this one in my laptop bag, and every time I pull out my laptop, I sit the journal beside it. I've been using it to jot down all the things I want to remember! Thank you so much for the sweet gifts, Heather! I LOVE them! Now I'll be sipping and writing in style! We are giving away a $50 Starbucks gift card OR $50 for PayPal to one lucky winner who gets to choose their gift! Giveaway will run from today until October 8th. Good luck! a Rafflecopter giveaway I showed you my fun swap items, and I want to see yours! Link up your mugs! What a sweet gift from Heather. I love the mug's wooden handle! What a fun and unique mug! Love it! What a great little package! 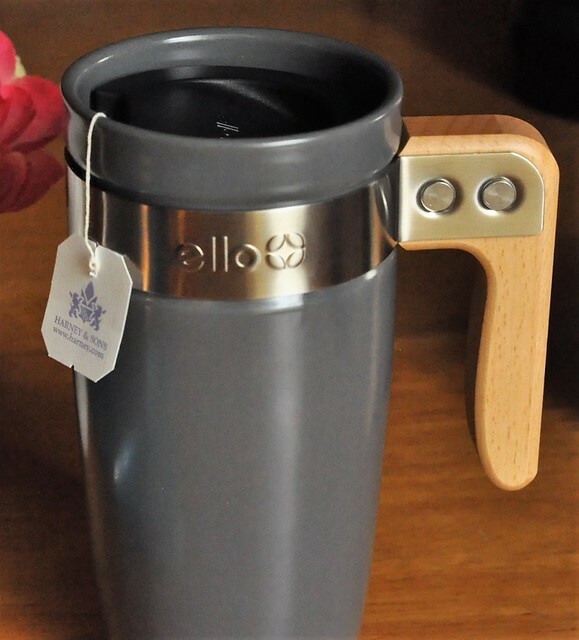 I love the handle on that travel mug! What a great travel mug! That is a super nice mug! I love the notebook, too. 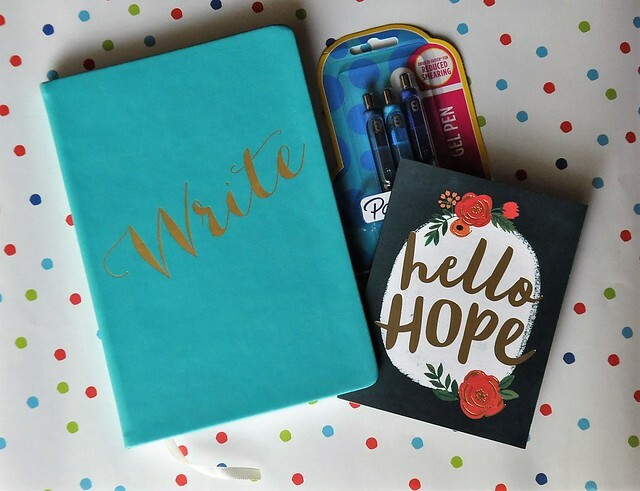 I'm a sucker for pretty notepads and paper products. Great package! Love the notebook!! Love! What a fun mug. That handle is so unique. Happy FriYay! She did such a great job! 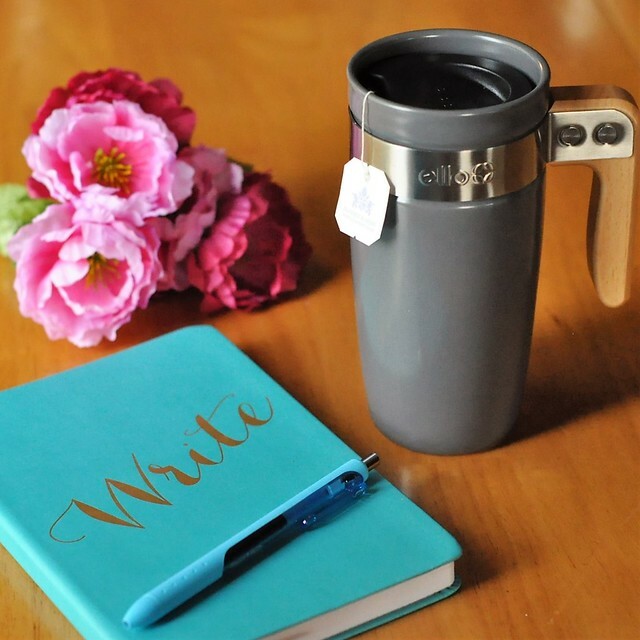 I love your travel mug and the journal is perfection!!! So you!